That was the resounding takeaway from Atlanta charter school founder Gavin Samms Friday night, despite an impassioned discussion on school choice that shook a Morehouse College auditorium and brought several attendees to their feet. 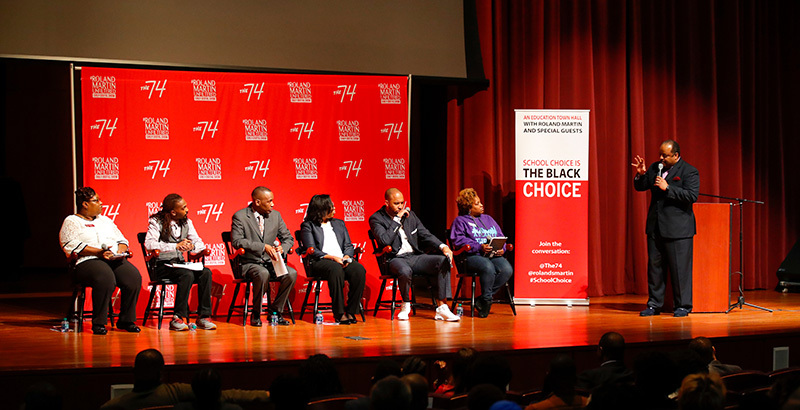 Approximately 300 families and community advocates attended “Is School Choice the Black Choice?”— an education town hall led by broadcast journalist Roland Martin at the historically black college in Atlanta. The event was the second in a 10-city tour hosted by Martin and The 74. The gatherings seek to engage black families and stakeholders on issues of educational equity, student achievement, and parent involvement. (You can replay the full livestream from Atlanta; we’ve also rounded up the most notable reactions from the event.) The inaugural event was held in Indianapolis in December. And while the fiery debate may have offered the contentious narrative that the black community is battling itself on school choice, Samms said it was quite the opposite, and that the African-American community must work together to set a specific agenda for their children. 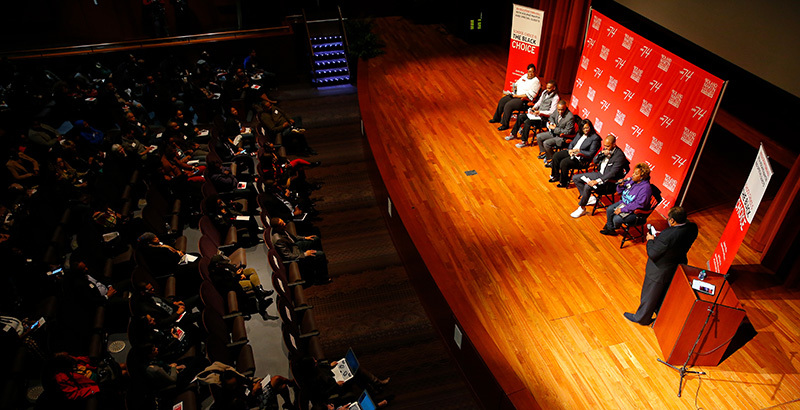 This is an issue that is too important for town hall attendees to walk away as adversaries, said Curtis Valentine, deputy director for the Progressive Policy Institute’s Reinventing America’s Schools project. Also on the panel were Atlanta Thrive parent organizer Aretta Baldon, EdConnect CEO Danielle LeSure, educator and blogger Jason Allen, and Democratic Georgia state Rep. Valencia Stovall. Although charter system enrollment in Georgia fell by 1.3 percent between the 2017-18 and 2018-19 school years, it has grown by more than 2,000 percent over the past decade. And state lawmakers last spring increased funding for state charter schools. Georgia’s charter landscape earned another window of growth opportunity in 2012, when voters gave a state-level agency — the State Charter Schools Commission — the power to authorize schools that don’t make the cut at the district level. In 2015, Atlanta was ranked the ninth-best city in the country for school choice by the Fordham Institute. And Atlanta Public Schools last year narrowly gave KIPP, the city’s largest charter school operator, the green light to add 1,100 seats. 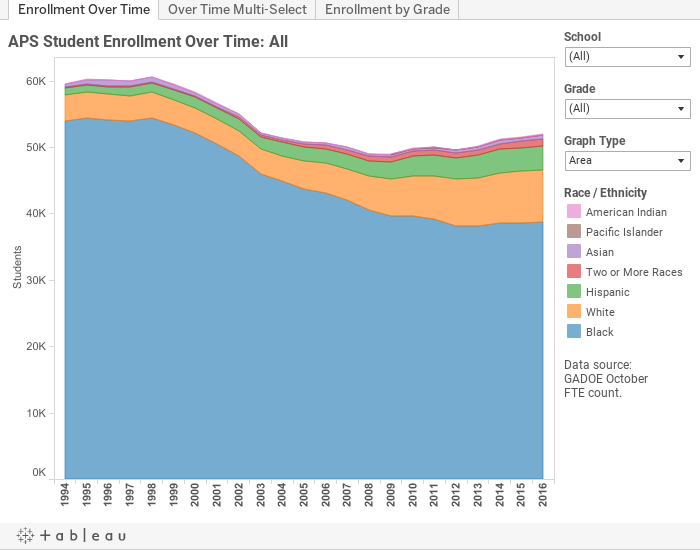 Three-quarters of Atlanta Public Schools’ 52,000 students are black. Despite their enrollment majority, black students performed poorly on the 2017 National Assessment of Educational Progress compared to their white peers, who comprise only 15 percent of the district’s student population. White APS students outscored black and Hispanic students by about 50 points on the exam, also known as the Nation’s Report Card — marking a greater racial achievement gap than any urban school district in the U.S. other than Washington, D.C.’s. That’s where school choice advocates are hoping charter and non-traditional school options can fit in — to offer alternative methods of education for black students where the 20th century model isn’t working. And a key piece of that is to push for more black educators and policy leaders, Samms said. It’s also important for black families to know the black leaders are educating their children according to their needs and “in a way that works for us,” LeSure said. Atlanta’s charter system also mirrors the greater public student population by overwhelmingly serving black students and children from low-income families. More than three-quarters of Atlanta’s charter school students qualify for free or reduced-price lunch, and black students comprise 75.6 percent of the city’s charter student population, according to data from the Georgia Department of Education. Across the state as a whole, 60 percent of charter school students qualify for free or reduced-price lunch and black students make up a much smaller share of the charter school population at 38 percent. In 2015, 80 percent of Atlanta’s black children lived in poverty-dense neighborhoods, compared with just 6 percent of white children and 29 percent of Asians, according to a report by the Annie E. Casey Foundation. But 68 percent of school board members in America don’t have children in the district that they represent, Valentine said. And with the advancements made in recent years across sectors and globally, the competition for jobs is no longer just with those at home, but with those around the world. National partners for the event include the American Federation for Children, EdChoice, ExcelinEd, J. Hood & Associates, the National Alliance for Public Charter Schools, Progressive Policy Institute, UNCF, and the Walton Family Foundation.